We’re in the last weeks of the scarf project for the Special Olympics. These are the last states with deadlines through 8 March. If you’re making any scarves for these states, please mail them in now so that they’ll get them in time for their games. * Two states will continue to collect scarves throughout the year for their games next year. SO Arkansas – colours are RH Cherry Red and Grey Heather. SO Oklahoma – colours ar RH Cherry Red and Black. * SO South Dakota just wrote in and said they have about 400 scarves. * No updated numbers received from the other state programs. They’ll be posted as we get them, but I think it’s safe to say that their goals will not be met by the deadline dates. * Some state programs have indicated that they will continue the project for next year. They will decide on the colours sometime in the summer or early fall (hopefully earlier). We’ll cross that bridge when we get to it. In the meantime, come on over and join us. Click on the links to the Facebook and Ravelry groups. We’ll be working on one or two smaller causes in the meantime. We’re in the last stretch of the project, with deadlines coming. The numbers are pretty much the same; the scarves are still coming in dribs and drabs. Some states have extended their deadlines, which should help the crafters make some more and add to the numbers. Here’s a collage of the wonderful scarves made by the crafters. * SO Delaware – has met their quota; if you have completed scarves for Delaware, please send them directly to the SO office address. * SO Maryland – has 50/400 confirmed received; if you have completed scarves for Maryland, please send them directly to the SO office address. * SO Washington – they have not received any scarves; deadline is extended to 22 February 2013; if you have completed scarves for Washington, please send them in now. There’s still time to make one or two scarves for the remaining states with deadlines in February and March. Or click on the Facebook and Ravelry links to take you to the group for more details. Hope to see you in the groups! Well, several deadlines for states to receive the scarves for their winter games have come and gone. Only one state, Iowa, has met their goal. Other states look to be on track to meet their numbers before their deadline, while others are struggling. * SO Alaska – deadline extended through 1 March 2013. * SO Kentucky – deadline extended through 24 January 2013. They reduced their required numbers to 300, and since they already have 277, they don’t need too much by 24 January. If you have completed scarves, please mail items by 21 January to ensure that they receive the scarves before they leave for the Winter Games during the weekend of 24 January. * SO New Jersey – deadline extended through 4 February 2013. * SO Oklahoma – they’ve received enough for a small event, but are nowhere near the number they need for their games. They will continue to collect scarves through December 2013, and use those for next year instead. * SO Tennessee – deadline has passed, but if you have completed scarves for them, please mail them directly to the SO office. If not, then please consider mailing them to SO Colorado, which has the same colours, and will surely help them meet their goal. Here’s a summary of where we are today. * 1 March – Utah – 10-15 of 300 received (an estimate; they haven’t opened the package yet). Complete details can be found on the Facebook page ‘Knit and Crochet for a Cause‘ and the Ravelry group State Special Olympics Scarf Project. Click on the links on the sidebar at the right. It’s been slow so far, and as is usually the case, there’ll probably be an avalanche of scarves sent in towards the last week before the deadlines. The holiday season has caught up with us, and there’s other priorities and projects going on. There’s actually been a day or two that I haven’t picked up yarn to work on projects! Imagine that! A day without playing with yarn! That’s awful, isn’t it? There’s still time to join in on the fun and make a scarf or two. Complete information is found on the Facebook page Knit and Crochet for a Cause, and on the Ravelry group State Special Olympics Scarves. And for inspiration, here’s some photos of completed scarves, submitted by talented crafters. Hurricane Sandy was in the forecast last week. Since there was a possibility of being house-bound for a some days, I looked forward to spending some time with yarn and catching up on all the projects. First up was the Special Olympics scarf project. I was almost done with this one for South Dakota, so I brought it out to work on first. Taking out all the others, I worked on the finishing touches – weaving in ends, adding fringes, blocking. And when all that was done, the scarves are ready for mailing. Here’s the complete set I’ve finished so far. From left to right, scarves for Maryland; Iowa/Kansas; Vermont; Texas/Utah; West Virginia; Arkansas/Ohio; South Dakota; Alaska. And I’ve surpassed my goal … to make more than the five that I made last year! Yaaayyy !! For more information on the Special Olympics Scarf Project, go to the Facebook KC4-Special Olympics page and Ravelry links on the right bar. The Scarf Project is in full swing! As of today, we have 19 states participating and over 13,000 scarves to make. And about 10,o00 to make for December 2012 and January 2013. All of a sudden I’m nervous … are we going to make those numbers in time? I know that we’ve just started on this, but the first deadline is in four months, and seeing those numbers suddenly boggled my mind. 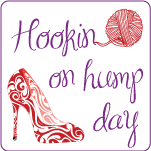 I’m sure we’ll make it … us crafters can crank those scarves out everyday! lol Here’s a scarf that I was working while on the beach a couple of weeks ago. Here’s a summary of the participating states. Full and complete information can be found on the Facebook page, Knit and Crochet for a Cause, or on Ravelry – State Special Olympics Scarf Project. Or click on the links in the sidebar. Come over and join us. We’re just starting to have fun.